Wednesday night, I had the pleasure of attending Awesome Talks Ottawa hosted by ReSoMe and Suprpod at Shopify. The night opened with Doug Tetzner, Talent Scout at Shopify, who talked about hiring awesome people. I have always been a big believer that your company is only as good as your employees. Tetzner preaches hiring not based on a score a candidate might get from checking off a list of “requirements” but on feeling. He suggests when having an interview have a conversation, find out their life story. You will be amazed what you may learn that might sway you to hire or not hire that person – information that would not come out in the typical interview style. 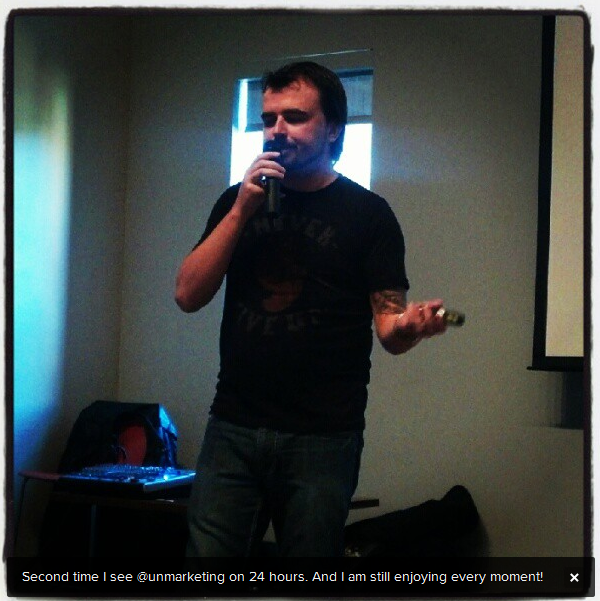 I am a huge fan of Scott Stratten, also known as @unmarketing on Twitter. So much so, that I didn’t just see him once in 24 hours, but twice. Scott was the opening keynote at the Canadian Internet Registry Authority’s AGM. Normally, Scott is the biggest deal on Twitter, but at the AGM he was joined by another famous Twitter person… Biz Stone, you know the guy who invented Twitter. Scott needed to regain his online famous power, so he spoke as the keynote at Awesome Talks Ottawa, which suits him so well, because he is so awesome! Scott is the President of Un-Marketing. He is an expert in Viral, Social, and Authentic Marketing which he calls Un-Marketing. He has over 125,000 people following his daily rantings on Twitter and was just named one of the top five social media influencers in the world on Forbes.com. He is the author of the unbook called UnMarketing: Stop Marketing. Start Engaging., and his most recent book The Book of Business Awesome, which covers concepts related to marketing, branding, human resources, public relations, social media, and customer service. From success stories to train-wrecks, Scott offers tools to use in your own business, and showcases what not to do. I was caught between being so engaged in his presentations that I couldn’t take my eyes of him and wanting to tweet everything he said. My tweets from that day pretty sum up how awesome his presentation was. Here is what I was able to tweet, enjoy! Remember, you have the power to save kitten all across the world! This entry was posted in Social media and tagged awesome talks ottawa, biz stone, scott stratten, social media engagement, stop it, the book of business awesome, unmarketing by Kristine D'Arbelles. Bookmark the permalink. Great…no scratch that…awesome piece and could not agree with you more. I can’t stop recognising awesome and unawesome things! I ascribe this to what I call the Stratten Effect.